Lichgate lore tells us a bit about Laura Jepsen's vehicle. Laura mentions her car three times, once in a letter from 1960, again ina letter from 1969 and in Chapter 7 of her book, Lichgate on High Road. In her book, Laura writes, "During the winter the house was invariably cold, even though logs were burning in the fireplace, but about ten in the morning the sun rose high enough to heat the glass of my windows. Then for several hours my bulldog, Ch. Fearnought’s Ace (Kip), and I would go outdoors and sit in the car to keep warm. Thus seeking the sun, we enjoyed the benefit of solar heat without the expense of installation." 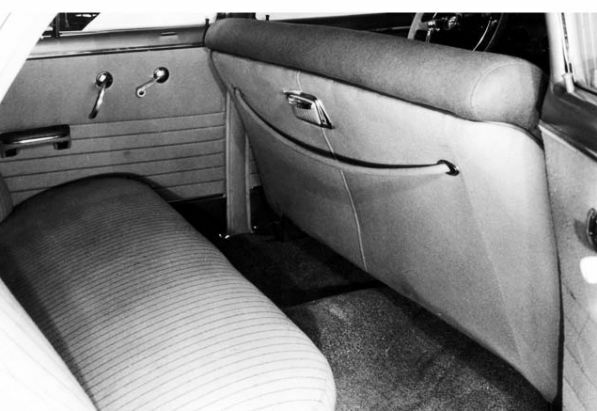 Since the cottage was only heated via the fireplace and was uninsulated, in the early years Laura would go and sit in the car during the day in order to warm herself and her four-legged companion with the sun shining through the car windows. 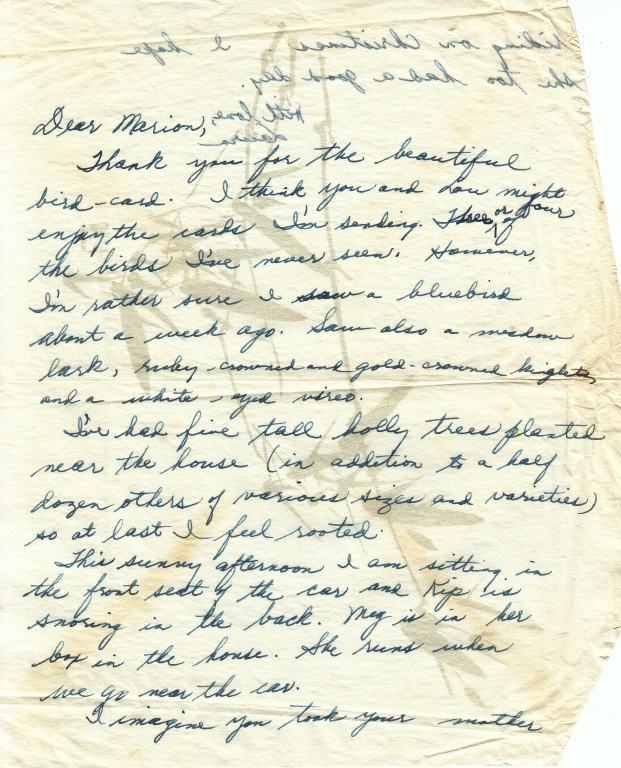 This story from her book is reflected in a letter Laura wrote on December 30, 1960 where she says, "This sunny afternoon I am sitting in the front seat of the car and Kip is snoring in the back." I’m giving the Humanities test to 30 students & before they finish I’ll have time to write. Keys are enclosed. Three dogs went to the kennel Sunday. I’m thankful for I hardly have time to set down a plate of food for the other two. In Thomasville the 3 will fare better than they would confined much of the day in my garage. The pup will have to go on a lead to keep her from cars. Maybe Teddy thinks he’s done all he can for his mother. It was good of you to visit her and hard, I know. A million dollars would be scorned by many of the undergraduates today. They are often idealistic. Your flowers must be beautiful. Laurel is blooming on my place here & perhaps there also. I’ll take the quiet roads – not interstate. Yesterday my car was inspected & one rear light failed to work. 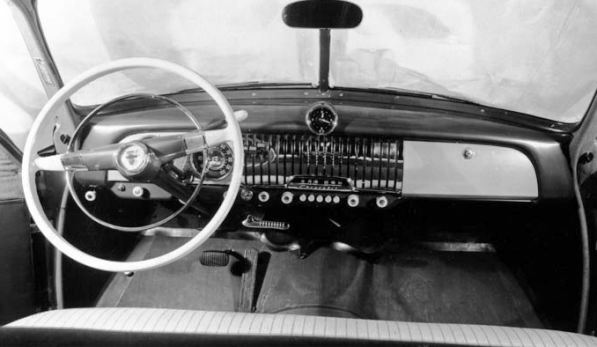 Mr. Sheffield said he couldn’t get parts for the 1951 car, but he got something from a yard of abandoned cars, I think, & made it work, - all but signal lights. Then he took off my signal lights & went back himself for inspection & reluctantly they gave him a seal (passing) since the car did not have such lights originally. Tomorrow I plan to spend at the Chevrolet Co. to see what they can put on as signals & for a check of the car. I’ll probably take a taxi home. Mrs. Polly asked about price of the N. C. land next to me, I must write her. 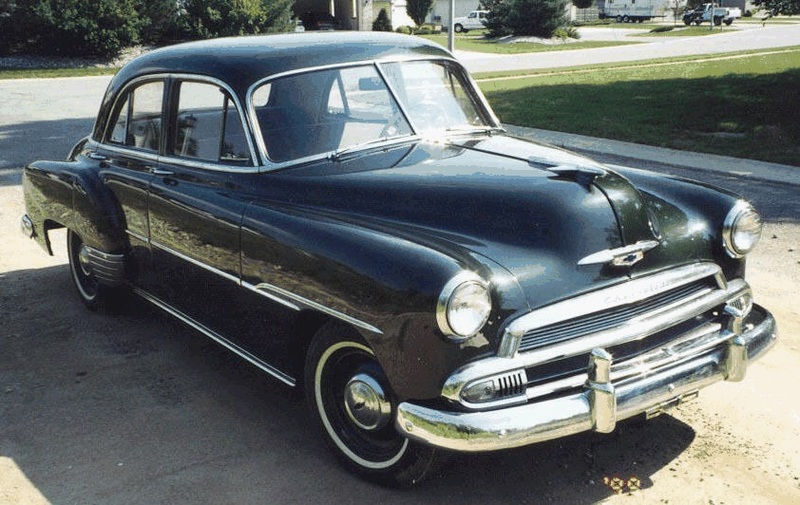 Laura's car was a 1951 Chevrolet 4-door sedan like the one pictured. Other views of what how Laura's car appeared can be found accompanying this text. 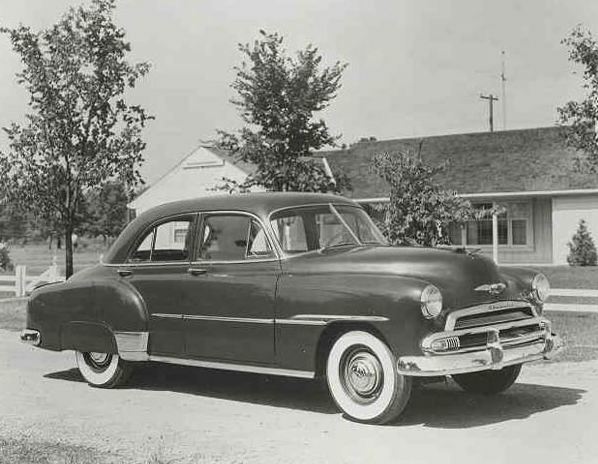 This was the only car owned by Laura and the one she learned to drive in, the original cost was $1,594. It is said to have appeared in a film by the noted director, Victor Nuñez who still remains associated with the nearby FSU Film School. Conversations with people such as Carolyn Collins who know the director narrows the movie down to "Flash of Green" released in 1984.
Review of this film shows only one vehicle fitting the description and model year of Laura's sedan and the clip can be viewed at this link. The quality of the clip is unfortunately not very good, this movie was released in a VHS format and is difficult to find in digital. 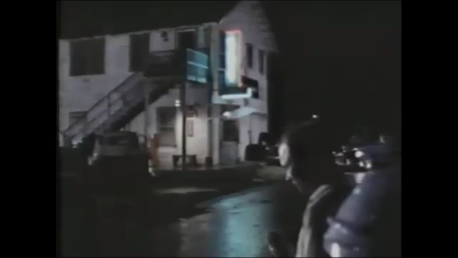 In the scene Laura's car enters the parking lot on the the far right. This is the only known picture of Laura's car. The ultimate fate of this vehicle remains a mystery. It appears to have still been in Laura's possession at the time of her death but where it went afterwards is unknown. Remarkably Laura's 1969 letter reveals something even more unusual than her view of the counter-revolutionary outlook of class. In the opening sentence of the letter she mentions having time to write the letter as her Humanities class undergoes a quiz. Ever the frugal person, Laura actually composed this letter on the back of the very test she was giving her students. 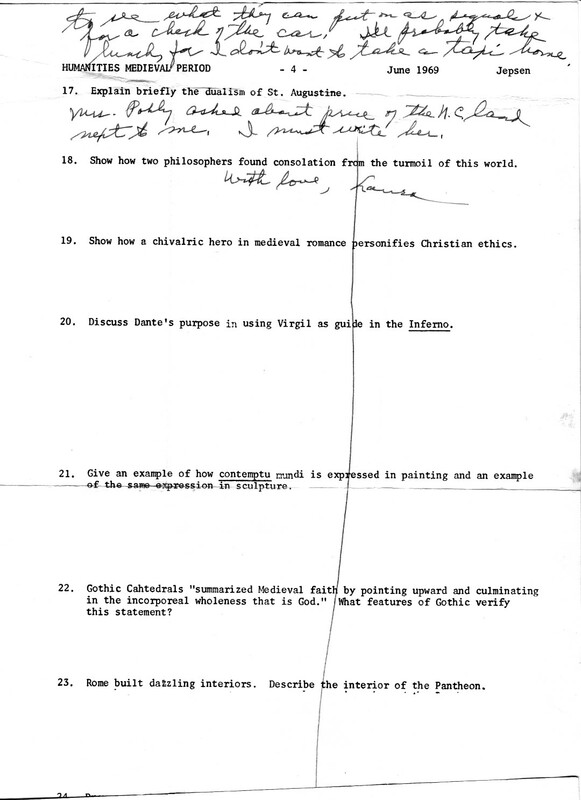 This portion of the test she handed out on June 3, 1969 is the only known surviving copy of one of her tests and shows us a bit of what taught. You can view a copy of the test in PDF or JPG format . How many of the questions could you answer?